HCAHPS regulations will collect information about patient experience of care. ICWUSA mounts may help improve patient satisfaction. 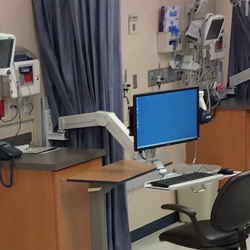 Space-saving computer mounting arms optimize workspace and workflow, enabling caregivers to focus more attention on the patient. While healthcare costs are rising, hospitals are being asked to deliver higher quality of patient care at a lower price. Meanwhile, patients have increasingly high expectations for a quality hospital experience. New HCAHPS (Hospital Consumer Assessment of Healthcare Provider and Systems) regulations have created a national standard for collecting and publicly reporting information about patient experience of care. Providing an excellent patient experience is tied more closely than ever to reimbursements. HCAHPS regulations require hospitals to demonstrate that patient engagement and satisfaction are a top priority. Because patient satisfaction is strongly influenced by the amount of time nurses remain in the room, hospitals are increasing the number of services at bedside. Computers that are easily accessible to doctors and nurses at the patient’s bedside enable them to promptly record and retrieve patients’ data such as vital signs, medical records, and prescription types and doses. Computer mounting solutions that allow for face-to-face interaction, protect patient privacy and are intuitive to use will play a key role in successfully transitioning more services to the patient’s side, increasing patient engagement. In-room computers are vital for shifting charting activities to the patient’s side. With articulating ICW mounts, caregivers are able to chart while being face-to-face with patients. – Chart and review history while in the patient room. – Adjust for the ergonomic comfort of each caregiver. –	Rotate the arm and monitor to show patients their on-screen data and become involved in their own care. –	Perform these simple actions to engender trust in the caregiver and consequently improve patient satisfaction.